If the unconventional manner of which one dresses is tantamount to the many creative visual possibilities that one can do, then Jujiin Samonte’s “Exhibit Number One” is an event NOT to be missed. The 27-year-old style savant and blogger Jujiin Samonte is a self-taught photographer and stylist, currently dabbling in videography. He has been cited in various publications, blogs and websites (both local and international) for his unique individual style. Having grown up during the 90s, Jujiin lists then-designer Cecile Zamora, labels Warp and Milkwear, the Candy Kids sub-culture, the Spice Girls, and Japanese fashion magazine Fruits as his influences. In photography, he likes the unglamorous approach of tandem Inez & Vinoodh, and admires the clean, strong photographs by Hedi Slimane. In fashion, he looks up to the works of stylist Panos Yiapanis and creative director Nicola Formichetti. “Exhibit Number One” is Jujiin Samonte’s first celebratory display of selected photos he has taken, both old and new. His idiosyncratic works and eccentric visions will be put on view in a deconstructed parade that is as provocative and stirring as the way he sees and presents fashion. “Exhibit Number One” is on January 29, Friday, 7PM, at Trilogy Boutique & Canteen, located at 110 Alvion Center, Rada Street, Legaspi Village, Makati City. “Exhibit No. 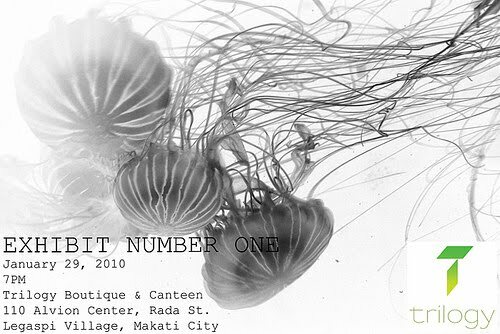 1” also marks Trilogy’s first in-store event for the year 2010.